Multinational operations, undertaken through ad-hoc coalitions as well as permanent alliances such as the North Atlantic Treaty Organization (NATO), have been and will continue to be a prominent feature of US security policy. Multinational operations offer a number of benefits, including enhanced capabilities, burden sharing, and international legitimacy. However, the characteristics of coalition warfare can also create unique challenges for preventing and addressing civilian harm, including differing political incentives, complicated and sometimes parallel command structures, variable levels of interoperability, disparate rules of engagement (ROE) and national caveats, and diverging civilian harm-related policies, such as incident assessment, public acknowledgement, and amends. 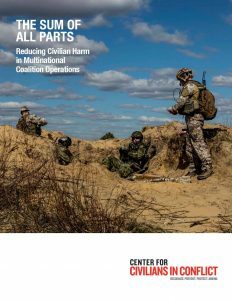 This report explores these challenges in detail and identifies meaningful recommendations for civilian and military leaders to mitigate challenges and seize opportunities to prevent and address civilian harm in future coalition operations. While this report focuses primarily on coalitions which the US leads or is involved in, its analysis may carry relevance for other coalitions as well.